I love basketball, especially NBA basketball. I am a big fan of the San Antonio Spurs, and also enjoy the Suns, Dwayne Wade of the Heat(not a big Shaq fan). But I grew up watching the Celtics. My dad has always been a Celtics fan, he loved Larry Bird, Kevin McHale, Robert Parish, Danny Ainge(who he got to open gym with at BYU). 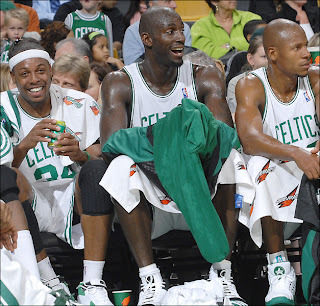 So it has been really exciting to see Kevin Garnett and Ray Allen join Paul Pierce to bring the Celtics back to their glory days. The big three are back. And they have played like they are. I am excited to see a resurgent Celtic team take it all the way and then play against my beloved San Antonio Spurs in the Finals, the storied franchise against the new dynasty. How fantastic! 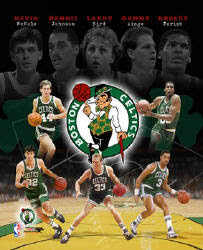 "As the Celtics' season crept toward tipoff, Allen watched the video montage of Red lighting his cigar on the bench, and Cousy dribbling out the clock and Bird stealing the ball and passing it underneath to DJ who laid it in. He watched it all, and the goose-bumps ran up and down his arms. It made him, he said, feel so insignificant. And it made Allen ask himself a question. “What can we do to put our little dent in Boston sports history?” he wondered later." i love paul pierce. he used to be jayhawk, which is my KS team! !